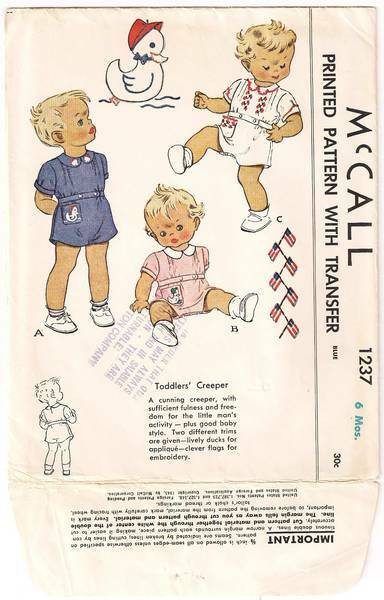 Home Children's Patterns Sizes 1-4 1940's McCall 1237 Precious Toddlers' Creeper Pattern 6 Mos. Cunning creeper combines style with sufficient fullness for activity. Transfers are included for duck applique or flag embroidery. Size 6 Months; Chest 19; Waist 19. Pattern is complete and has been carefully cut. Transfers are unused. Click additional image below to view entire envelope front.